Josefina Gabrielle (center) with the company of London's "Chicago"
Josefina Gabrielle has been an invaluable West End presence in productions ranging from Oklahoma! as Laurey opposite Hugh Jackman to Gussie in the Maria Friedman-directed Merrily We Roll Along. Gabrielle is currently back on the boards in the perennial favorite Chicago, having previously played Roxie but this time high-kicking a leg or two at the Phoenix Theatre as Velma, alongside Cuba Gooding Jr. as Billy Flynn. Broadway.com spoke to the delightful performer about returning to a show she knows, but in a different guise. 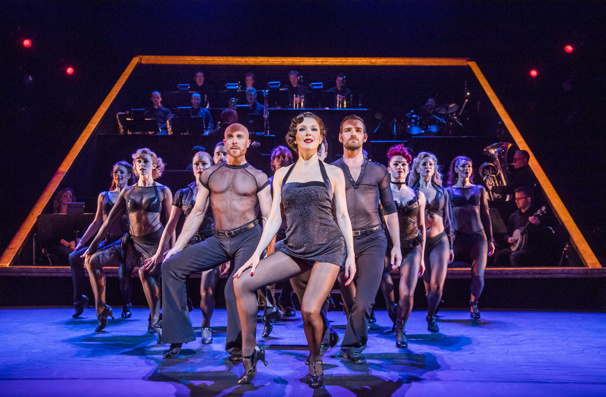 Does this latest West End run of Chicago feel like a homecoming? It’s thrilling to be back because I thought that chapter had closed so to have the book open again really is quite something. I’ve always said that if I got to choose my career, I would have a yearly stint in Chicago, so to be able to revisit it is just wonderful. Every time you put these roles on, it’s like wearing the crown jewels: it’s a privilege to get to play roles that Bob Fosse created on such a phenomenal set of originals [Chita Rivera and Gwen Verdon]. Having played Roxie multiple times, do you now see yourself as a Velma? Well, I would look at “All That Jazz” and “Cell Block Tango” and “Class” and think, “They’re my favorite songs in the show!” I’m very excited to be performing those. What do you think led the producers to offering you Velma, having first given you Roxie? This is just speculation, but put it this way: when I was doing Sweet Charity [at the Menier and then the Haymarket], [Chicago producer] Barry Weissler came to see it and was very complimentary. He said, “I never thought of you as a Velma before, but now having seen you as Nickie, I could see that”—so maybe the seed was sewn then? How would you compare the two roles? I’ve obviously done Roxie enough to really feel embodied in that journey. Velma’s journey is still very new to me: I’m learning the nuts and bolts of what comes where and what happens when. What are your instincts about Velma as a character? My feeling about Velma is that she wants to be established as top dog, so the challenge for her is one of constantly reinventing on the hoof so as to stay up there: a bit like a spider in the bath just clambering and clambering but not giving up. What do you think she thinks about Roxie? For Velma it’s a lot about realizing that this seemingly unthreatening new person [Roxie] is actually far more savvy than Velma had anticipated, in part because Roxie is so spontaneous: she just reacts fearlessly in the moment and thinks later. Velma, on the other hand, is more calculating. She keeps her cool and observes and absorbs and changes course, and ultimately I guess they both realize that their ways do match, which is why they are savvy enough to collaborate finally. As you prepare to play Velma, do you find yourself being drawn back to Roxie? It’s funny, you’d think maybe you would be drawn toward what you recognize. But because I’m learning Velma, Roxie is sort of disappearing from my mind as Velma becomes more comfortable in me. Occasionally, I’ll have a little nostalgic gesture to join in on a song that I can hear being rehearsed in another room when I fondly remember doing that. But mostly I’ve been maintaining focus, which has to be on Velma. How many times did you play Roxie? I’ve lost count! [laughs] The very last time was the tenth anniversary, and that was 11 years ago. But it does feel like home because Bob Fosse was such a genius about creating this work for two stellar muses. Isn’t Velma a very different gig physically? Oh, it’s a lot more physical: you’re throwing yourself around and leaping and jumping and throwing your head back and thinking, “My neck is going to crack.” [laughs] By contrast, Roxie in a way is less defined so you can get away with more, and the more you bring to the table, the more they encourage you to do. How does it feel to have as Matron “Mama” Morton a performer—Ruthie Henshall—who has herself played both Roxie and Velma over time? I asked Ruthie how she felt about things and the comparisons and the risk of getting so invested in one part at the expense of the other. She gave me lots of good practical advice about “that bit is tiring” or “you get a break here”: it’s been very helpful. How fun is it, too, that “Mama” gets to be Velma’s onstage partner? And what can you tell us about your Billy Flynn, Oscar winner Cuba Gooding Jr. in his West End debut? He’s delightful! What I find fascinating is that when Chicago opened on Broadway, the O.J. Simpson trial was rife and there were parallels between the show and what was going on there, so it’s an amazing coincidence to be opening Chicago afresh with Cuba, who portrayed O.J. in that fantastic series [The People v. O.J. Simpson: American Crime Story]. On that front, how do you think the show resonates in an age in which a reality-TV star has become the U.S. president? Well, the interesting thing is that we say in this era now that everything seems to be showbiz, but then you start to roll back and you realize that it never wasn’t! We seem so shocked by it now because it’s everywhere but in fact it was ever thus: there was always the publicity machine spinning someone to the foreground but, like everything these days, it’s become more and more accessible. Given that you were in Charlie and the Chocolate Factory for more than two and a half years, do you have any idea what’s next after this? No, I’ve completely immersed myself in this; I’m not a very good multitasker. I tend to absorb one thing at a time. What about a version of Chicago like the recent West End revival of Schiller’s Mary Stuart in which the two leading ladies tossed a coin each show to see who they would play at that performance? I’m enjoying the idea of a world where that does happen, and I’d never say no, But I’m not sure I’d fancy a coin toss. Not to mention the fact that I may find now that my Roxie would be so hard-nosed that she wouldn’t be very appealing. You don’t know how much you’ve changed in ten years!